- Hi Grandma, it's me. - Wow, sweetie, your voice sounds so clear and different from what I remember. 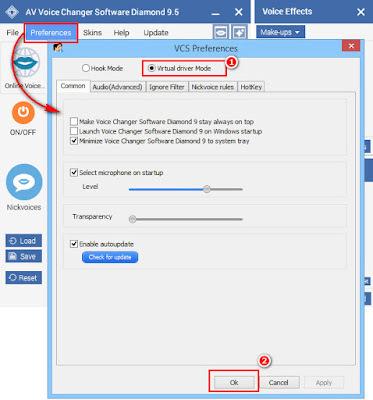 In this tutorial, you will learn how to change your original voice to any voice you want and improve the Viber call quality with AV Voice Changer Software Diamond 9.5 (VCSD9.5). Viber is a mobile application that allows you to make phone calls and send text messages to all other Viber users for free. Having the same style of Viber calls again and again is not a very exciting way to have a special conversation. 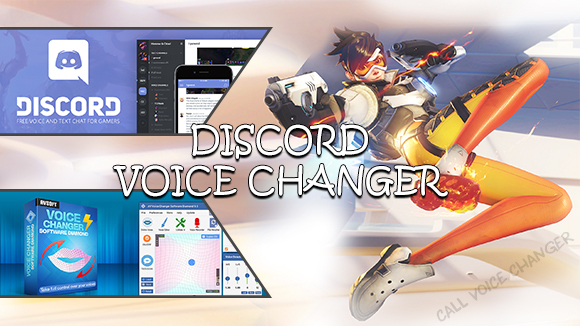 With call voice changer, your internet calls will be very different and more lively than ever. AV Voice Changer Software Diamond 9.5 is an easy-to-use software that can change your voice in real time and improve your call quality while using VoIP programs such as Skype, Viber, etc. It can also be used in many other programs, even in online games and Steam platform. 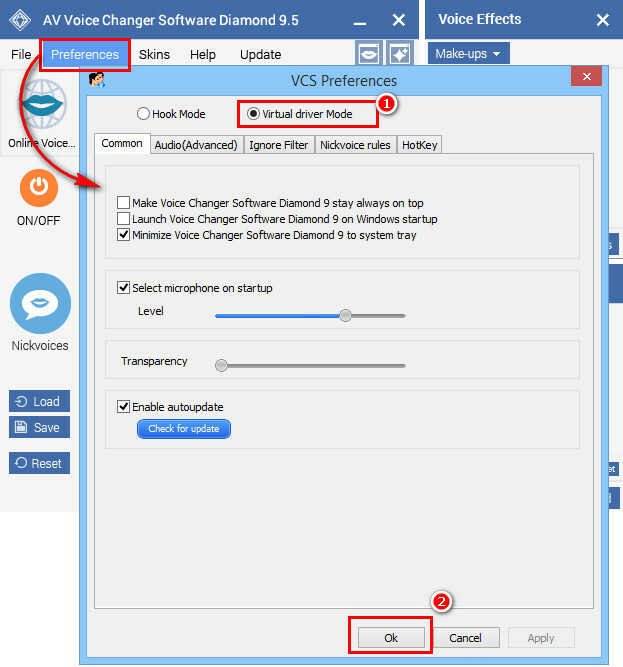 - On AV Voice Changer Software Diamond 9.5 main panel, click Preferences to open the VCS Preferences window. In the VCS Preferences window, we will change Hook mode to Virtual driver Mode. - Click the OK button (2) to apply the new settings and close the VCS Preferences window. - Run Viber, login to your account. 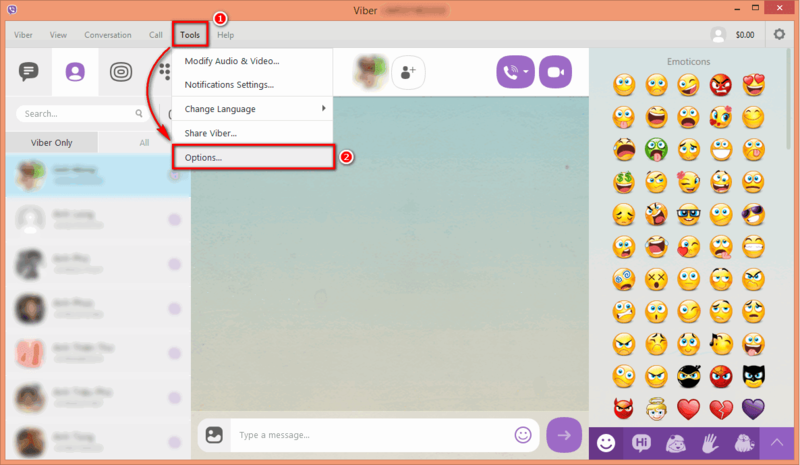 - Click Tools menu (1) >> choose Option (2) to open Viber Settings dialog box. - In the Viber Settings dialog box, choose Audio & Video (3). - In the Audio Input section, choose Microphone (Avsoft Virtual Audio Device) for your microphone (4). 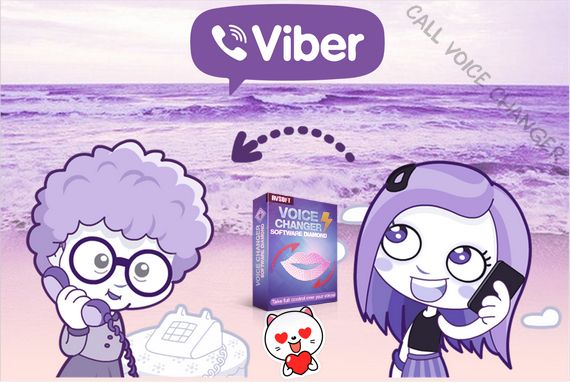 From now on, VCS Virtual Audio Driver will be the main audio driver recognized by Viber. - Return to the main panel, choose the morphing effects and make adjustments until your are satisfied with your vocal output. There are several ways to change your voice, including voice morphing and audio effects. Note: Remember to polish your voice to be more natural with Vowel Enhancer. - And now, surprise your family and your friends with better Viber calls. 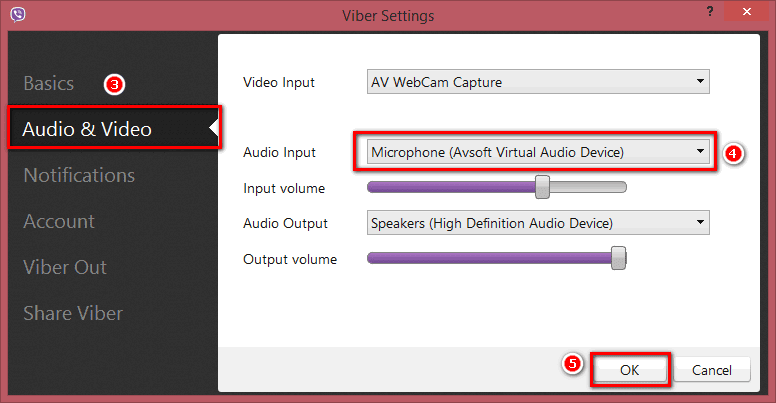 Note: While VCSD Virtual Audio Driver is being set as the audio driver for Viber, do NOT turn off VCSD9.5 when doing voice chat. 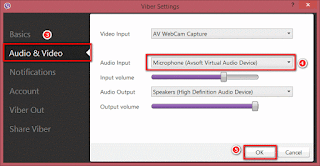 If you don’t want to use VCSD9.5, change the audio settings of Viber back to normal audio source.